With less than 10 days to go before Christmas, it's time for a little indulgence. I won't bore you with more broccoli recipes before the end of the year. Instead, I'll share some of my new Christmas cookie recipes with you. What makes a cookie a Christmas cookie, anyway? I never really understood. Fact is, although it is totally unscientific, cookies taste somehow better around Christmas. Perhaps it's my cultural upbringing that makes me believe that you HAVE TO HAVE cookies of some sorts in the house. Today's recipe is inspired by David Lebovitz' Baci Di Dama Cookie recipe. Looking at the ingredients list, they resemble pretty much the Mexican Wedding Cookie or Snowball Cookie recipe. But hazelnuts are being used in these, and I realized that I haven't baked with hazelnuts for far too long. I substituted rice flour with brown rice flour, and plain white sugar with coconut sugar or Jaggery to make them more nutritious and a bit healthier. Working on the dough, I thought I'd treat it the same way as my snowball cookies. This would simplify Lebovitz' recipe a lot. The results were a success all over. Honestly, I even believe that Lebovitz' complicated rolling, refrigerating and cutting of the dough would not result in a better cookie. I found the size of each cookie big enough to count as one cookie. So I decided to just drizzle a little chocolate over the top, instead of sticking two cookies together with a chocolate layer in the middle. I have baked these cookies twice within a week. My son goes straight to the cookie jar when he comes home from school. 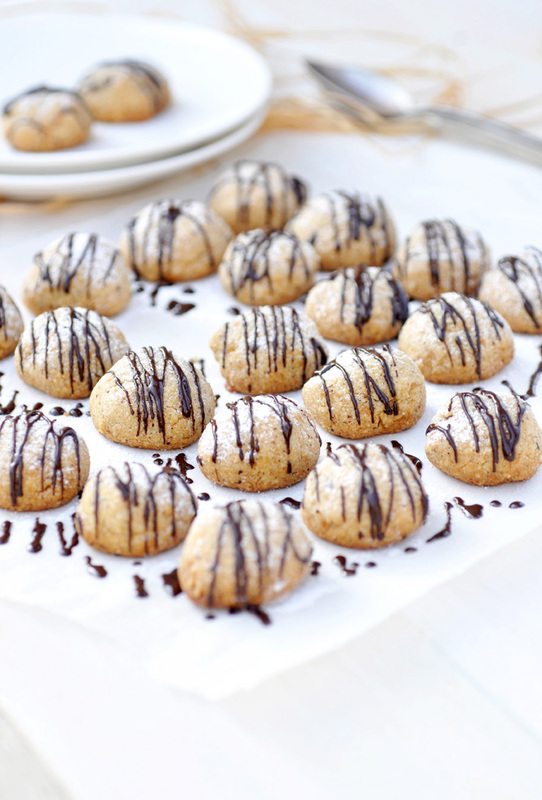 If you love hazelnuts, you will love these! No matter if it's Christmas or not.